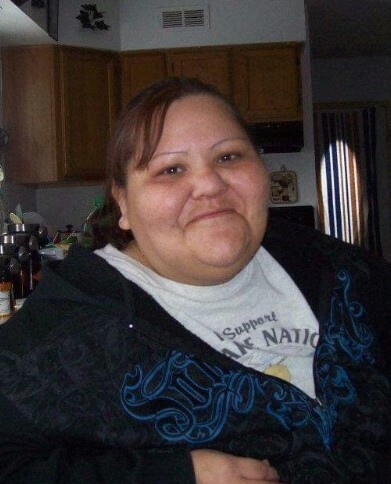 Karen Lynn Bedeau, 49 years old, of Red Lake, Minnesota entered the spirit world on November 24th, 2018. She was born to Darlene Jourdain and the late Lawrence Bedeau in Red Lake, MN on July 11, 1969. Karen grew up and went to school in Red Lake. After school, she worked for the 7 Clans Casino for more than 14 years. Karen also worked for the Red Lake Agency, the Red Lake Detention Complex as a cook, for the Affordable Professionals as a PCA and was also a foster parent to many children. Karen enjoyed going to the casino, playing bingo, riding around with her friends and hanging out and play’n dice with her family and friends. She especially loved spending time with her granddaughter Avrianna and her great nieces, nephews and family. Family that Karen is reunited with are her father; Lawrence Bedeau, brothers; Steven Bedeau and Brian Jourdain, maternal grandparents; William and Elsie Jourdain, paternal grandparents; Robert and Mary Bedeau, aunties; Alice Spears, Catherine Burns and Florence Bedeau, her namesake; Karen Payer and uncles; Melvin Bedeau and William “Butch” Jourdain. She leaves behind her mother; Darlene Jourdain, children; Lenelle and Lenette Sumner and Dylan Bedeau, her pride and joy-her granddaughter; Avrianna Rose White, sisters; Laureen (Merrill) Neadeau, Connie (Frank) Bedeau and Melani (Donald) Bedeau, brothers; Todd and Steven Bedeau, Sr., nephews; Dale Whitefeather, Tyron Isham and Brian Jourdain, Jr., niece; Andrea Jourdain, many great nieces and nephews, aunties and uncles, other family members and friends. A wake for Karen will begin at 1:00 p.m., Wednesday, November 28th and continue until her 2:00 p.m. funeral service on Friday, November 30th all being held at the Old Little Rock Community Center in Red Lake, MN. Father Jerry Rogers will officiate. Pallbearers for Karen will be Todd Bedeau, Steven Bedeau, Sr., Phil Sayers, Ron Sigana, Frank Beaulieu and Donald Fairbanks, Jr. Alternate pallbearers are Wes Jourdain and Brandon Bedeau. Her honorary pallbearers are Mary Ellen Cook, Shanelle Sigana, Nonny Sigana, Bobby Ann Lussier, Vicky Roy, Elwyn Neadeau, Sheldon Mason, Jr., Todd Jourdain, Merrill Neadeau, Val Thompson, Delilah Benais, Stevie Bedeau, James Bedeau, Stephanie Bedeau, Levayah Raincloud, A’Lyncia Raincloud, Marty “Juno” Raincloud III, Jade Bedeau and Samaria Sumner. Interment will be in the St. Mary’s Catholic Cemetery at Red Lake, MN immediately following her services.